Budget travellers to Mauritius take note - if you can find a better place than Casa Florida, at the same price, we'd like to hear from you! So, if you're a looking for a low cost holiday in Mauritius, read on (if you're looking to live in the lap of luxury this article aint for you!). 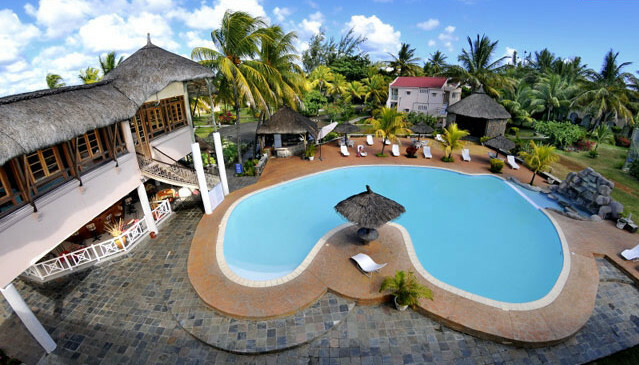 Casa Florida is situated on the northern side of Mauritius, some 5 minutes walk from the beautiful Pereybere beach and even closer to a supermarket & bus stop. It's about a 10 minute drive to Grand Bay. So, save a bit of money to spend on other things on the island. Fill in the form to check availability & prices. At the prices charged don't expect 5 star fanciness, but it is clean, has large rooms and is functional. Basically the perfect spot to stay if you've come to see Mauritius, rather than spend a lot of time in a hotel. We have negotiated rates with Casa Florida. Rates fluctuate depending on the exchange rate, and whether you're staying over Christmas and New Year. All Casa Florida's rooms open onto a private balcony or terrace, and all have a daily cleaning service and mosquito destroyer. Bring your own towels for the beach and pool. We flew with Air Mauritius from Johannesburg and stayed at the Mont Choisy Hotel for 7 days. One stop travel picked us up at the airport and the next day we went to Ile aux Cerfs (an island off Mauritius). There we went parasailing in knee deep water and could see the fish swimming with us - it was stunning. On day 2 of the trip we visited the waterfront where they had a lovely market which we enjoyed shopping at. The next day we didnt go anywhere we just relaxed in the hotel and went for a Valentines day massage. I went on a kayak and it was a disaster - my husband went on one kayak and I told him I'mm not joining him because i dont know how to kayak. He was in the water and I thought it looked easy and decided to go on one. I was at first just going in circles and than the undercurrents were quite bad and started pulling me in. My husband could see I was in trouble and he tried to pull me with him but couldnt kayak and pull at the same time. In the distance not too far we saw a speedboat and shouted to them and they came closer and carried me off the kayak and put me on the speed boat. They were my heros. On day 3 we went on the glass boat and could see the beautiful coral and fish - it was amazing. On day 4 we relaxed again, just swimming at the hotel pool. The staff of Mont Choisy were very friendly, always smiling and happy. They couldnt stop taking pics of us. Towards the end of my holiday was my birthday and my husband got them to make me a cake and they sang for me. It was the perfect end to the perfect holiday. May to September is the best time to visit Mauritius for surfing, when the prevailing winds blow onto the south coast. Tamarin Bay is the prime spot for surfing in Mauritius, but the south & west coasts of the island have a lot of more consistent surfing spots. Watch Forgotten Island of Santosha for mental preperation. Mauritius has 5 nine hole courses & 8 eighteen hole golf courses. Amongst them being Belle Mare Plage's Legend Golf Course and Links Golf Course, Tamarina Golf Club and Paradis Golf Club. The Old Manor House, which is situated near Plaisance Airport, is going to be converted into the first Holiday Inn Mauritius. “Mauritius is continuing to see an increase in visitor numbers and with that, an increased demand for a range of accommodation options. With Holiday Inn, we are responding to this demand by catering to the mid-scale market and offering a global brand that people know and trust. A Holiday Inn at the airport is a perfect complement to our InterContinental Resort Mauritius which opened in 2009, and we’re delighted to be expanding in this market.” said IHG's COO, Pascal Gauvin.